As fall nears I'm getting more excited about layering and cable knit sweaters. Here is an outfit I am craving for the cooler months and the turning of leaves. 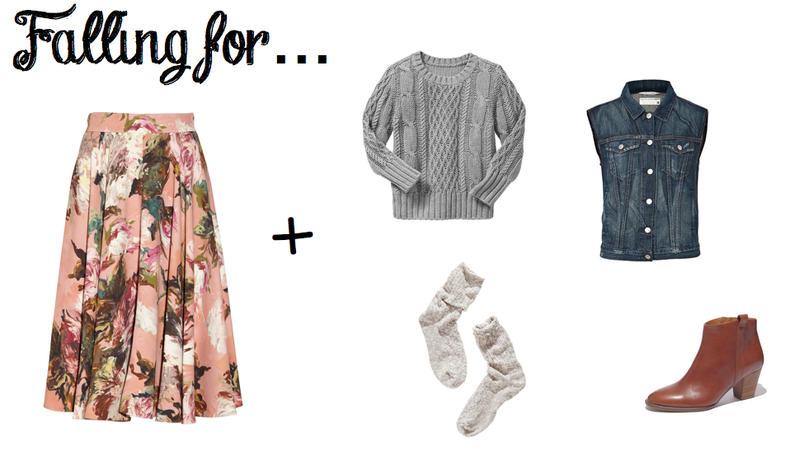 I've been dying for a floral full skirt, this piece I'll be making with vintage fabric. I always love a good thick cable knit sweater in a subtle color like a heather, grey or ivory. As of late I've been adding a jeans vest to layer, I suppose this is a bit of the grunge look that is so in, seeping into my style. Lastly, a full skirt that shows off your lower calves and ankles is complemented quite well with a sleek ankle boot and if you have longer legs go for a scrunched bulky sock. Hope this has inspired you to start fall wardrobe planning.